Sand Casting Process: In sand casting, the molten metal is poured into the cavity, which has a pattern made of wood or metal. The patterns is a exact replica of the shape that the metal is to casted in. 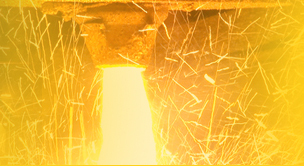 Molten metal in introduced into the cavity in the shape of the casting to be made. When the cast solidifies the mold is broken to remove the castings. Since, the initial method of wet and baked sand mold were expensive, new method of sand mixing have been invented where the use of chemical and adhesives are used to bind the aggregate. The basic material which is the sand or the clay is usually taken from the banks or the lakes. Now a days sand molds are made that can be used for automated casting processes. A variety of patterns are used like the match plate and cope and drag pattern for enabling in giving the required shape to the molten metals. The cuts and cavities are made by making use of the cores. Use of Machines: Mostly sand casting is manually executed, since the mold are broken on completion of the solidification process. But in order to speed up the casting process, machines are used for some special operation int eh sand casting process. Machine aids are used for sand preparation, mold preparation, production of casting boxes, ramming sand properly around the pattern, extraction of the finished workpieces, etc. Machines are also used for handling the castings, re preparation of the sand and for mixing the components for making molds. Sand Casting Applications : Sand casting is extensively used, for cast iron and steel parts of medium and large size where surface smoothness and dimensional precision are the main concerns. 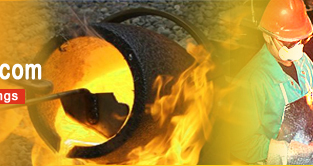 Sand casting is also used to make large parts in material like bronze, brass, aluminum, etc. Also used for casting sculptures which can have a certain amount of rough surface finish.